The Breaking Bad Movie continues to shoot in the Albuquerque area, revealing some familiar locations from the hit show. A super fan has been traveling around and snapping pictures of the areas and they hint at some flashbacks and the return of some beloved characters. With that being said, the movie is a huge mystery at this point in time. We know that it will focus on Jesse Pinkman's post-Breaking Bad life, but there sure seems to be a lot of scenes being shot in familiar areas for a guy who's supposedly on the run. Aaron Paul took a break from social media in December of last year, which is when the Breaking Bad movie started filming. Since then, he and director Vince Gilligan have been spotted in Albuquerque quite a bit. Jesse Pinkman's car has been spotted too, along with Mike's car, which is weird because Mike is dead. This leads one to believe that flashbacks will be a big portion of the movie. The area where they shot the compound lab has also been spotted with crew members around it. The vacuum cleaner place that Ed, the Disappearer, conducts his business out of has also been spotted with the Breaking Bad crew in and around it. The Pinkman house was used as a location too, which could mean that Jesse's mother will make an appearance. It's possible that Jesse Pinkman could have left Albuquerque and goes back in the movie, but that isn't clear at this time. With all of the familiar locations, it seems like the safe bet is on a number of flashbacks. Even the strip mall that Saul Goodman works out of was spotted with a set of crew members. Related: Breaking Bad Movie Is a Sequel That Follows Aaron Paul's Jesse Pinkman? Bryan Cranston has hinted he will be a part of the Breaking Bad movie, which only reinforces the flashback theories. The iconic Walter White character famously died during the last episode of the hit series, which is when it is believed the new movie will take place. However, like anything else about the movie, it has yet to be confirmed. With that being said, these new pictures from the set paint a pretty interesting picture of what we're going to see when the Breaking Bad movie debuts. Though not confirmed, it is believed that Bryan Cranston (Walter White), Krysten Ritter (Jane), Jonathan Banks (Mike), Jesse Plemons (Todd), Charles Baker (Skinny Pete), Matt Jones (Badger), Robert Forster (Ed), Tess Harper (Mrs. Pinkman), and Kevin Rankin (Kenny) will make appearances in the Breaking Bad movie, which makes it seem like a reunion. It looks like Vince Gilligan is working like Lucasfilm and Marvel Studios, keeping everything a secret and he's doing a great job. One would have thought that Aaron Paul would have announced something by now, but he's taken a vow of silence on social media. You can check out some of the familiar places from the Breaking Bad movie set below, thanks to the It's All About Saul Instagram account. Breaking Bad Movie Plot Hidden in Old Quote from Creator Vince Gilligan? 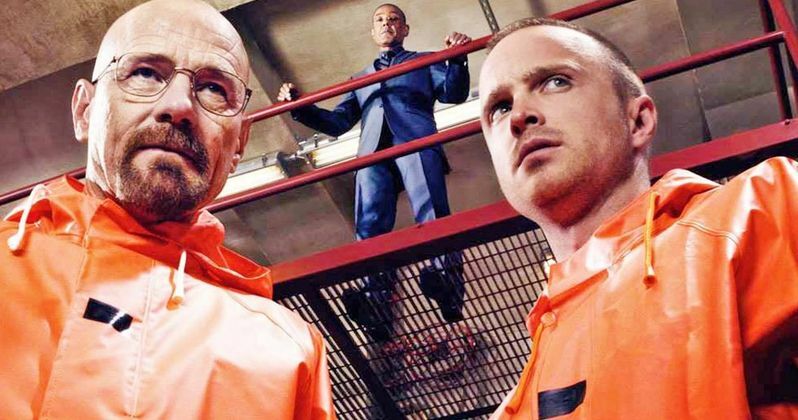 Breaking Bad Movie Leak Reveals Returning Cast Including Bryan Cranston? Walter White Won't Return in Breaking Bad Movie Even for a Cameo? Bryan Cranston Confirms Breaking Bad Movie, Will Walter White Return?